Form Follows Function is a maxim of modern design and the Iron Case from Trico Sports seems to have taken it to heart. This summer, I headed to Europe for a family vacation that included a breakaway to the Maratona dles Dolomites for me. That meant the bike was coming too and I was not willing to risk my pride and joy to a cardboard box from the LBS. A few calls later and I had an Iron Case in my garage on loan from a friend. The Iron Case uses foam inside a polycarbonite shell. No fancy graphics, bright colors or aero frills, the Iron Case is a big gray slab of hard plastic and costs around $385. It is a shipping container of a case and when the cargo is your precious bike that's a good thing in my book. The low marks on the appearance front are easily outweighed by its strengths. 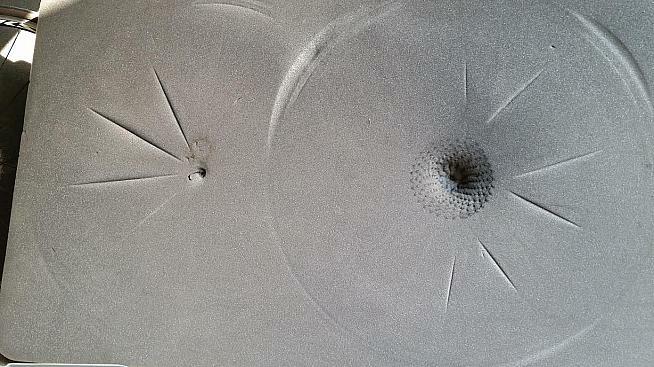 The two halves of the exterior are made of a polycarbonate and seem bombproof. They slide over each other which allows you to adjust the depth of the case using the straps that go around the outside. Inside, the frame is sandwiched between two layers of dense foam with the wheels above beneath a third foam layer in the style of a club sandwich. The pedals, handlebars and seat must be removed (more on this later) and I packed bubblewrap around the moving parts for extra peace of mind. I also slid out the skewers to reduce the depth of the wheels, but that might not have been necessary. There was plenty of room to nestle a helmet, bottles and a few bits and pieces around the frame. It took a few attempts to sort out the best way to nest the wheels so that the cassette did not hit the frame on the layer below, but in all it took just a few minutes to work it out. Straps pull the two halves of the shell together. The straps are solid with heavy plastic clasps and it was simple to tighten them to bring the shells together without feeling that you had to overtighten and put too much pressure on the contents. There are clasps for locking the case, although I did not use them. Once packed, the Iron Case, which weighs 31lbs empty came in just under the airline limit, but was relatively easy to shift around due to the built-in wheels. This was especially true on smooth airport floors. 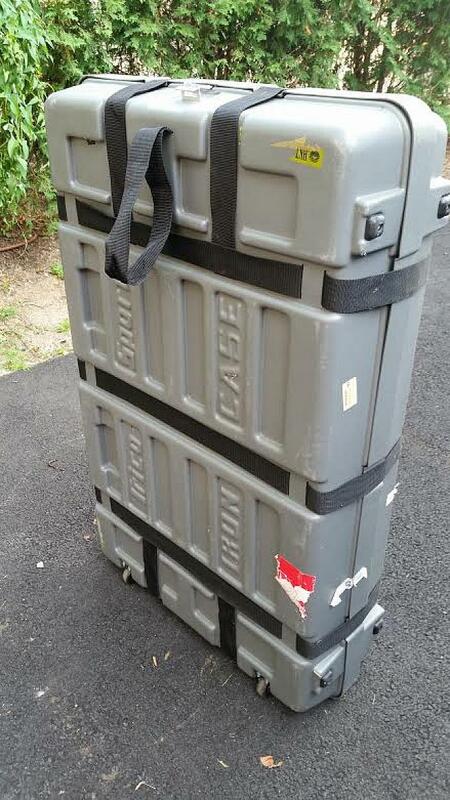 The Iron Case is surprisingly easy to move around. The other side of the Atlantic, reassembly was a nice challenge while jetlagged with the added benefit of "requiring" a test spin just to check everything was working properly once everything had been put back together. Job done. While a complete success, I did learn a couple of things from flying with a bike for the first time. Factor in the additional bulk of the bike case when planning arrangements to get to and from airports. 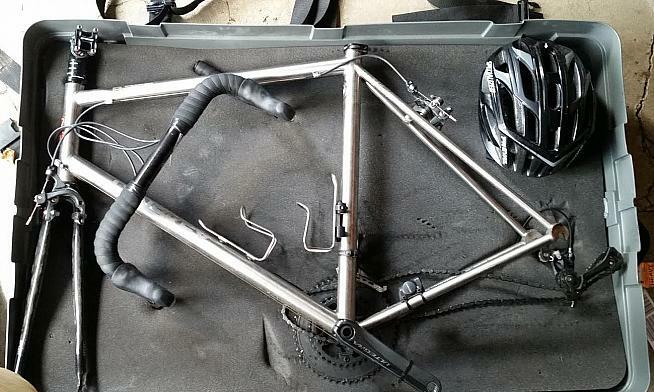 Under no circumstances leave it until the night before departure to find out that your seat post is seized in the frame because it was not greased properly when assembled initially. I speak from experience. 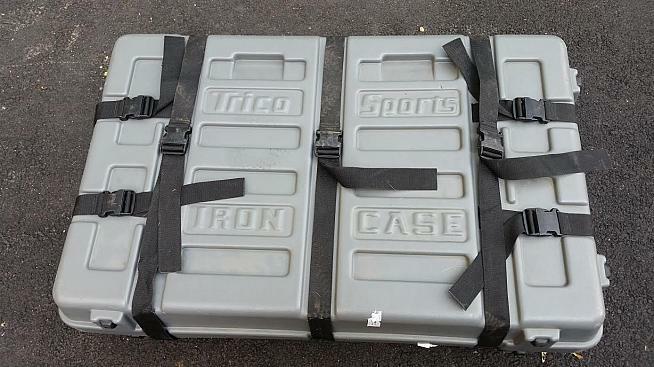 Overall, the Iron Case by Trico Sports is a superbly functional bit of kit even if it is not the prettiest item in the world. Most importantly it gave me peace of mind that my bike was properly cocooned from the indignities of air travel and would arrive undamaged. That's beautiful. Wheels are sandwiched between foam layers. Trico Sports of Sylmar, CA. Started in 1984 with the Memoflex Gel Saddle Pad and then added shorts and gloves before launching the Iron Case over 20 years ago. Trico has an extensive dealer network.